Khole Kadarshian wants Lamar to go back to Rehab but He's kicking against it - BlogIT with OLIVIA!!! According to TMZ, Lamar's drinking has reached crisis level for Khole Kadarshian, and she desperately wants him to get help NOW ... but Lamar's digging in his heels. Sources close to the still married duo tell TMZ that Khloe's doing everything she can to convince him to get treatment for addiction. They said LO's happy to go to physical rehab, but refuses to deal with his drug demons. 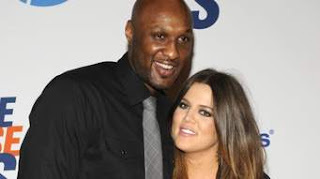 TMZ said Khloe's even suggested an outpatient program, but Odom remains defiant. Odom's own family members are also striking out. According to their sources, they've tried to convince him by pointing out several relatives, including his father, have addiction issues. Lamar's been communicating with his 2 kids in NY recently, but seeing him in a bar makes even them worry their dad will fall back out of their lives.